I finished this dining room makeover. On time, no less. If you would have asked me three days ago if I thought I would have been able to pull this thing off, I would have burst into tears and hid my face. There’s something about thinking that I have a month and a half to finish a simple room makeover that brings out the procrastinator in me. I wait and wait and think “there’s always next week”. Until it is “next week” and I find myself with a room full of shiplap to paint, a table to finish building and staining and then, of course, there’s the brick wall to install and grout. Lordy. I have definitely learned a thing or two from these last two One Room Challenges. Most importantly, start working ASAP and don’t let up until the bigger projects are crossed off the list. Speaking of lists, let’s take one last look at the plans I had for this space before I dish out all of the makeover goodness. There is no wood shelving unit. We built the darn thing and put it in place, and there just wasn’t enough room in the space for it. Bummer. All is not lost, though. I’ll find a space in this house for it. The same chalkboard that occupied this room is still there. It’s not the oversized magnetic one that I had my heart set on. We ran out of time with the other projects and this just had to be scrapped……for now. I did not build that beautiful little coffee bar. Around week three I realized that I wouldn’t have enough time to build one, and seeing how this was a crucial part of the makeover, I went ahead and purchased one. I am in love with it, though. I’m glad I swallowed my pride and just bought it because it is exactly what we needed, it fits the space perfectly, and it meets all of requirements I had for a coffee bar. But enough talk about what didn’t happen. Let’s get to the main attraction. I’ll try to keep the words to a minimum. Here is the room before…. We added shiplap walls and painted it my favorite white ever, Alabaster from Sherwin-Williams. The chandelier. Oh my word. It adds the perfect touch of industrial. The jute rug brings in texture beautifully. Our kitties love lounging on it in the morning sunlight. I don’t blame them. My husband and I built this table ourselves, and I think it makes so much more sense with the bay window than the old rectangular table did. My hubby mixed stains together to create this gorgeous color and he completely nailed the exact look I was envisioning. I love him. We trimmed out the windows and painted them the same white as the shiplap. My favorite part of the space, by far, is the brick accent wall we installed. I was going to white wash it but ran out of time. I still think it looks incredible as it is. The whitewashing will have to wait another day. It seems really silly to be so enamored with something like a coffee bar, but I am! I love that it takes some of the clutter off the kitchen counters and it is absolutely cute to boot. It was important to me to find something tall enough so that it was comfortable for my hubby to make his coffee. We will be filling the bottom shelves with baskets full of our homeschool materials. I love that we can store all of our coffee and hot chocolate essentials in the cubbies and the little hooks make it easy to display our favorite mugs! This room is such an awkward space and is difficult to photograph. Here is a view of the semi whole room. LOVE! I’m thinking the pantry doors are in need of some contrast from all the white shiplap. Maybe gray or black? We shall see! There you have it folks! It’s so much more than I expected it to be. It was really amazing to watch my design board come to life right before my eyes and makes me want to try my hand at another room reveal. That will have to wait a while, though, because I am absolutely exhausted from all of the hard work we put in. And just for fun, let’s see one more comparison shot and a the design board. You can check my “Dining Room Makeover” board on Pinterest to see how I gathered inspiration for this room. Follow Little Red Brick House’s board Dining Room Makeover on Pinterest. I want to give the biggest shoutout and “thank you” to the sponsors whose amazing quality products helped make this dream makeover possible. I absolutely would not hesitate to recommend them to friends, family….everyone! This post was sponsored by the brands listed above. All views and opinions expressed in this post are 100% my own and no other compensation was provided. You can read my full disclosure policy. Thank you so much, Deborah! It was such a labor of love but I am so happy with it! You.did.amazing friend!!! I bet it flows so, so well with your “new” kitchen and it looks twice as big now! I love everything about it, congratulations!! Thank you, Em! It definitely looks a million times better with the kitchen. I’m excited to get that space finished up too! Better get to work! This is totally my DREAM DINING ROOM! The brick, the ship lap, that table, the light, THE COFFEE BAR (clearly I’m enamoured too!) … seriously girl, it’s absolutely perfect! SO in love!!! Oh, Krsit! You are so sweet! Thank you so much for being my biggest cheerleader! Ooooooh, the room is so beautiful! I just love the space so much! Wonderful job! Thank you so much, Lisa! I still cant believe it’s actually real, haha. Girl, you are amazing! I can not believe the transformation of this space, it’s absolutely stunning! The combination of the white plank wall and brick is simply perfection! And that coffee area is so cute. Great job my friend! Thank you, Katie! The brick and shiplap are definitely favorites! It is totally lovely! I may have to find a space to try Alabaster. It looks fantastic. Congrats on another fantastic project!!! Thank you, Heather! Alabaster is such a great white. I don’t think I’ll ever switch to another! Oh, thank you so much, Kendra! We have been enjoying it so much this past week! Sarah!!! I am sooooo in love with this space!!! It’s gorgeous! You did SUCH a fabulous job!!!! Yes, you most definitely nailed it. It’s gorgeous!! I’m swooning hard over your dining room! It is so beautiful! The table you built is amazing and I love your coffee bar! The shiplap keeps everything so bright and cheerful, but I love that you brought in texture with the rug and brick. Seriously, love it! Pinning! Thank you, Samantha! I’m so happy with how everything came together. It’s like a dream, haha! Thank you so much for pinning, friend! I think you nailed it! What a lovely and inviting space. The table y’all built is gorgeous and paired with the white slipped chairs are the best. I know this was a ton of work but the results look great! I took it sort of easy by redoing our fourth bedroom into a media room. You should be so proud of yourself! Great job! Thank you, Nancy! Definitely hard work but totally worth it. Still working my way through all of the links and I can’t wait to see your media room! Wow, wow, wow! I simply love it all – the shiplap, the brick feature wall, the table and especially that light! Beautifully done! Hi Sarah, I just love your new dining room…especially that brick accent wall. I looked through your past posts but couldn’t find whee you did that…could you send me the link. Think it’d be a neat feature in my home and I’d love to see how you did it. Also…I know you’re tempted to whitewash it, but there is something really neat about the way it is now…looks like it’s been there forever. Just lovely…and I didn’t even talk about your shiplap and that chandy! Thank you, Lynn! I’ve got a ton of tutorials coming up for all of the projects, so stay tuned! And after living with it for a week, I am so undecided on whitewashing the brick. I do love the way it looks and I’m scared to mess with it, haha. I’m going to sit on it for a while, I think. Thanks again for stopping by! It looks wonderful–but did I miss something? You seem to have lost space on the right hand side–where the hhutch used to be? Did you build a pantry there? Last year, I tackled my dining room during the ORC –and we hung a brick wall too. I tried to find an “industrial chandy” –your is much better! My husband also made my table but we ran out of time and it wasn’t finished before the ORC was over. So–well done! It is a fabulous room. Thank you, Alana! We had a pantry to the right before the makeover and it’s still there. It may be the angle of the photos I took, but it’s still the same footprint. Promise! Those six weeks really do fly by, so I can totally understand not having everything come together in time. My last ORC was like that. I attempted a kitchen makeover and failed miserably, lol. There are so many moving parts to a kitchen and things always come up. In fact, we’re still working on it. What a gorgeous room!! I can’t get enough of that table, and I can’t believe you guys built it yourselves – job well done!! Your mood board seriously came to life, which I think it sometimes hard to do, but you totally nailed it. Beautiful!! Thank you, Jenny! It really was weird to watch the mood board come to life like that. I’ve never had a space turn out exactly how I envisioned it, so it was definitely a huge surprise. It’s amazing to create a space that feels so “you”. I’m hooked now! Thank you so much, Min! I am absolutely in love with the brick and shiplap. Two of my most favorite things ever. 🙂 Thanks for stopping by! Its simply beautiful the dining room, its perfection and you did something that will always be classic and simple! Thank you, Maria! I’m so happy with how it turned out, and even more so that I finished on time! We’ve really been enjoying it this past week. I appreciate you stopping by! It’s gorgeous, Sarah! Love the brick and planked walls and that table is gorgeous!! You did an amazing job! Sarah – you definitely nailed it! Your hard work has paid off. We can’t believe how much you accomplished in just 6 weeks! Love the brick wall and all of your fantastic accessories! Way to go! Thank you, ladies! I can’t believe it came together in those last few days. It seriously was a miracle. I really appreciate you stopping by! Thank you, Ardith! I keep waffling over whitewashing the brick. I’m kind of digging it as is, too. Definitely going to give it some time before I decide. Thanks for stopping by! Hey, Sarah! Stunning makeover! I have been thinking about using brick in my eating nook as well, so loved to see this! It looks great-very fresh! Please share where you got the brick and how you installed it. We want to use it for our backsplash but love the way you used it on your bay window as we have one too that would look great in brick. Beautiful table! Thank you so much, Carmen! I’ve got a post coming up with all of the details on where I bought everything and then a bunch of tutorials for all of the work done, including the brick. Stay tuned, friend! It’s straight out of a magazine Sarah! Honestly, it’s breathtaking! Congrats, and enjoy all your hard work! Oh goodness, Iris! That is such a compliment coming from you. Thank you so much, friend! This is amazing!! I love the combination of the bricks and shiplap. The table you built with the white slipcovered chairs is just perfect. I love this! Thank you, Stacey! I still can’t believe it’s real! We’ve been enjoying it so much this past week. Absolutely beautiful! You really pulled all the elements together in a way that is calming and lovely while functional at the same time. Thank you, Jeanne! It turned out better than I ever expected. I am so happy with it. Thanks for stopping by, friend! Looks so great! I’m hoping you decide to leave the brick as is. I think it won’t make the same statement if it is white washed as it will get a bit more lost. I love that the red brick brings another texture to the room and draws your eye towards the windows. Thank you, Erin! You make some excellent points! After leaving it as is for this past week, I’m definitely more undecided on whether to whitewash or not. Gah! I do love the pop of color and I would absolutely hate for it to just fade into the other walls. I’m going to wait a while before deciding. Its amazing! You did a beautiful job. The table is perfect, I just love every inch of it. Nailed it??? You completely nailed it!!! brick wall. I simply adore it!! Love!! Sarah it’s absolutely amazing!!! You should be so proud of yourself for finishing it on time and for all the hard work you put into it! And that table is insane! So perfect for the space. Awesome job!!! Thank you so much, Bre! I don’t think I’ve ever worked this hard on a space, and I’m so happy with how it turned out. Definitely going to be enjoying it for years to come. Yes, you nailed it! It’s gorgeous. Now go and enjoy that character-filled space and dine on the table your hubby built. Congrats! Thank you so much! We’ve really been enjoying it this past week. Thanks for stopping by! This is stunning! I love sooo much of this! That table, the light, the wood, the brick, wow. Beautiful!!! Thank you so much, Emily! I can’t believe how much it turned out just like I had envisioned. It’s crazy! Please don’t whitewash that brick wall. I think it’s perfect the way it is. You definitely did it! I love the exposed brick and the chalkboard!!! So pretty! Thank you, Kemley! I’m so happy with it! Just beautiful Sarah! Your husband is quite the carpenter with that awesome table! I love the wall treatments you added! Whatever you do, don’t whitewash the brick wall. It provides a terrific contrasting texture and color! I adore this room. You did a great job! Haha! That is what everyone keeps telling me! And to be honest, I really do love it as is. Why mess with a good thing, right? Thank you so much for stopping by and for your kind words, Linda! Excellent makeover, I love it, I pinned it. Sarah, WOW! The transformation is incredible. Your hard work paid off SO MUCH! I am in awe that you built the table yourself. That is insane! Good work, my friend! Thank you, Bre! I’m still in shock that we knocked it out on time and that it turned out even better than I had envisioned. It really is like a dream. I don’t even recognize it as my own house! This is ah-mazing! I absolutely love every inch of it… and that coffee station! Perfect! Thank you, Erin! That coffee station makes me smile every morning. Ridiculous, but true! Thanks for stopping by, friend! Love the shiplap!! Your room is fabulous!! 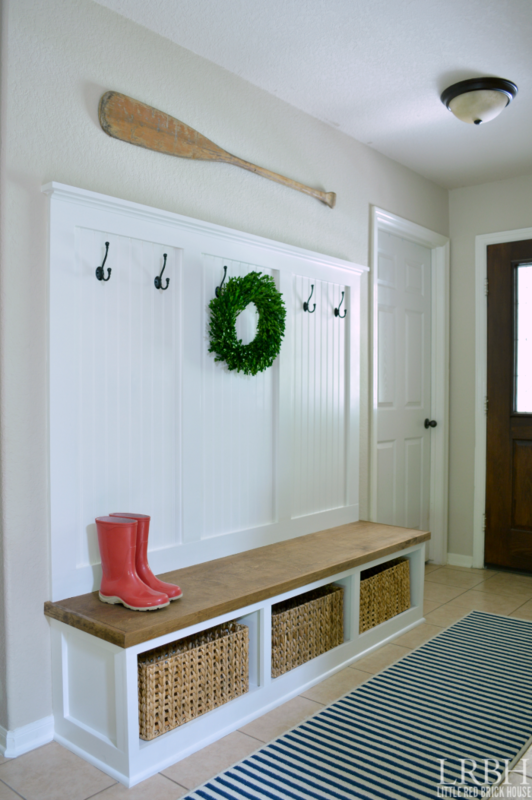 Please give shiplap details (size, where to purchase, ease of installation?? )…so want to copy this room!! Hi Debbie! I’ve got a tutorial coming up for the shiplap, so stay tuned! Thank you so much for stopping by! What?! Heck no! Don’t whitewash that fabulous brick wall! OMG I love it!!! I agree with you; I think those doors would look gorgeous in a dark gray or black. I love the contrast in this space. You did an AMAZING job, Sarah! Thank you, Lauren! Gah! I know! I’m having such a hard time deciding on whether to whitewash or not. I really love the space as it is, so I don’t want to ruin a good thing, haha. I’m going to sit on it for a while, but something tells me I’ll leave it alone. 😉 I can’t wait to tackle those doors! I absolutely love your dining room! That table is fantastic! Kudos to your hubby for coming up with that stain color. It’s perfection! Thank you, Sam! I will definitely pass those kudos along to him. He did a phenomenal job with the table. Thanks for stopping by! Wow, this turned out so amazing! I adore the table, wall and chandelier. It’s such an inviting space. Thank you so much, Ashley! The table is one of my favorite things about the space. Can’t wait to make so many memories at it. Wow! This makeover is stunning! I cannot believe you guys built the table AND DIY’d the brick accent wall. Amazing job, it all turned out so well 🙂 Congrats! Thank you, Natasha! I am still shocked that we finished all of the DIYs in time! That six weeks flew. This looks great! How did you make the brick wall happen? Is it fake brick or real? I’m thinking about doing the same thing in my dining room, but columns in the awkward diagonal spaces. Great job! Thank you, Christin! It’s real brick but it’s a veneer. I have a tutorial coming up showing how we applied the brick and everything. Stay tuned, friend! WHAAAT That brick is incredible!! I love this space! And I wish I had a coffee bar as pretty as that one! Thank you, Meg! The coffee bar has been so nice to wake up to every morning. Definitely a good start to the day! You did an amazing job creating that table. Simply perfect for the space. And…my favorite part of your transformation…that brick accent wall. Love it!!! The whole room is fabulous!!!! Thank you so much, Tammy! The brick wall is my favorite! Such a show-stopper! I love every bit of it! Thanks for linking up to the Pretty Project Party! This is one of the most beautiful makeovers EVER! I love it so much! What a fabulous transformation. The brick accent wall is gorgeous, whitewashed or not! And the table, ahhhmazing. Love that sweet little coffee bar area too. Great job!! Wow, it looks great! I LOVE the brick walls and the shiplap! I’m thinking of doing shiplap on one of the walls in my house and now I’m seriously considering the brick too! Thank you, Tania! I say go for it! It definitely takes some effort, but it’s totally worth it! Oh yes you nailed it!! I LOVE it all, every single bit! Beautiful, great job!! I didn’t do the room challenge this spring, after doing it last fall I knew it would be too hard in the spring, but this makes me want to do it again! Thank you, Mindi! You are so sweet! The ORC is seriously addicting. It’s so stressful when you’re in the thick of it, but you almost seem to forget all of that once it’s over, haha. LOVE LOVE LOVE! It’s so bright and inviting. Where did you find your fig tree in the basket? I’m on the hunt and am comparing a few options. This one is perfect! Thanks! Hi, Paige! Thank you so much! The fig tree is (affiliate link) this one from Walmart. I love it! This looks amazing! Can you tell me where you found the basket you put your tree in? Do you have plans for building that table? I will be posting the tutorial very soon, so stay tuned! Thanks for stopping by! I’ve never seen a room reveal and said WOW out loud, but I did with this one! Beautiful space. I love the brick wall the very very best–it’s such a wonderful touch. All of the homes I consider truly comforting (the houses of both of my grandmothers, the house I grew up in) had interior brick walls, but it’s something you never see done in new construction. I love it! Thank you so much, Erin! You are absolutely the sweetest! Hi there! Where did you get your coffee rack? I’ve pinned it about a billion of times on Pinterest but the links never take me to somewhere I can actually get it! Help please!!! Hi, Katie! You can check out all of the room sources in this post. https://littleredbrickhouse.com/industrial-farmhouse-dining-room-makeover-sources/ Hope that helps! Do you have a link to the plans you used for the table?! It looks amazing! Hi, Katie! I’m working on a tutorial for the table. I’ll be posting it in the next few weeks! Bravo!! You nailed it. I love every bit, especially the fresh feel to it all. Oh, thank you so much, Larissa! It’s definitely my favorite space in my home now! Will you be posting a tutorial for your brick wall? I’ve been dying to add brick to my dinning room and need a tutorial to give me that courage! Your home looks amazing! Hi Cynthia! Yes! I am working on the tutorial and should have it up soon! And thank you so much! HOLY! Love this- do you have a tutorial on how you did the brick wall? Or where you got the brick and the products used? Thank you so much!! Hi, Steph! Thank you so much! I have a tutorial in the works for how we installed the brick wall and where we got everything! I’ll be sure to send out an email blast when it posts! As many times I’ve been on pinterest I don’t know how I miss this room. I had no idea this was your dining room. It is absolutely divine. I think my favorite is the coffee bar. I love the table it sits on. Some are too small and don’t have enough room to actually make a cup of coffee. Luckily I have a huge kitchen to keep my coffee station on the counter. I have little grandkid fingers that would have it all on the floor. Lol again, beautiful job! Thank you so much, Amber! You are too sweet! Gotta watch out for those little curious fingers! When painting the shiplap walls, how did you not get paint in the space between the wood? Hi, Elizabeth! I rolled the coats on really lightly so there weren’t huge globs of paint everywhere. Some areas did get paint in between the planks but I just quickly ran through the gap with a flat head screwdriver before the paint dried. Hope that helps!